For many of us-dancing part of the tourist attractions in restaurants in seaside and mountain resorts. Naturally, this ancient ritual has changed beyond recognition in order to be interesting for foreign tourists. For a handful of people, however, residents of the ancient Strandja Mountain, this ritual is faith, holiness and lifestyle. They will tell you because they keep the ancient secret of the dancers, observing the tradition as their ancestors have done for centuries. And until now argue exactly when fire dancing originated and where its roots. Historical logic leads to the ancient Thracians, a people with a rich culture and religion. Thracian Orphism combines both sun worship and cult of earth and fire. The root of the word nestinarstvo some derived from the Greek word "anastenagmos" -vazdishane breathing. During the ritual trance dancers and breathe hard and fast. Many historians and ethnographers associate the name of the ritual of the Greek word "Hestia" - fire or "anasteno" which means resurrection. Which theory is correct hardly ever understand. The important thing is that this mystical rite has reached today and we see it in a completely authentic look still only in Strandja village of Bulgari. According to tradition dancers play only on the day of Saints Constantine and Helen, celebrated in old style on the night of 3 vs. 4 June Before the actual ritual starts, third day started so-called "dressing" of icons - the participants in the ritual surround them with a red cloth, edged with coins. After "dressing" borne of the hands of young fire-dancers led the procession, which includes the village and icons are transported to the holy spring of St. Constantine and St. Helena, which handles icons ritually washed. The accompaniment of drums and bagpipes, which are binding throughout the day winds long Strandja dance. Meanwhile, in the village of preparation is carried embers of old fire-dancers who stoke the games throughout the day. As the night embers spread and prepare for the actual ritual. Evening dancers head to Chapel of Elias, which burn incense, pray before the icons of the saints, listen to the beat of the drum in a specific rhythm and trance. Start dancing, carrying in his hands icons, towels, candles. Procession starts from the temple to the embers - the culmination of the celebration. Fire dancers take fire with a piercing cry, as there first proceed at - experienced fire-dancer, touring the coals three times and describes a cross in the fire, follow him and other fire-dancers. Fallen into a trance dancers lining up prayers and some even make predictions. Often bear arms in the embers children for health and longevity, healing the sick, but always with them is the icon of St.. Sv. 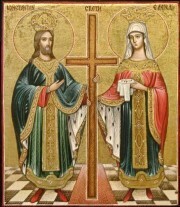 Konstantin and Elena. Nestinar end with long, traditional dance, which include all present. People from the village of Bulgari believe the fire purifies the soul, chasing diseases and evils and forgive the sins of the present. In 2009, fire-dancing was included in the UNESCO list of the Intangible Cultural Heritage of Humanity. In 2014 in the village of Bulgari opened the first museum-dancing, part of the tourist information center. In the museum you can see many pictures and objects related to the emergence and development of fire dancing.